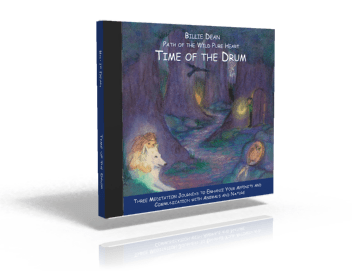 Time of the Drum is a set of three guided meditations that take you into a world of ancient forests and caves, Native American elders, fairies and water spirits, magic rock pools and empowering unicorns. Travel with Billie Dean and the music of Tribe World Ensemble to the Time of the Drum, a set of guided meditations that take you into a world of ancient forests and caves, Native American elders, fairies and water spirits, magic rock pools and empowering unicorns. Meet your wild self and your animal friends as you bring your innate gift of telepathic animal communication to present day consciousness. Use these guided meditations to relax and connect with your deep memories of telepathy. Get your pen and paper ready to write down your messages from the animals and natural world around you. In this meditation, Grandfather, one of Billie’s guides, helps you reconnect to your ancient gift of telepathy – the universal language of nature and animals. Set deep in the forest, Grandfather takes you back into the past, when you once had this gift and helps you bring it into the present. Designed to wash away negativity and doubt and put you into the frame of mind to receive silent communication, Billie calls upon the water spirits and the magic of unicorn to heal and empower you. 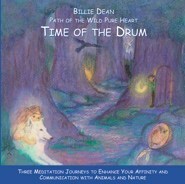 In this last meditation, we travel to the forest where we meet a special animal who journeys with you on the beat of the drum.